Applicants who wish to participate must have received their most recent degree (MLA, MARCH, PhD, MLAUD/MAUD, MCP/MUP, etc.) on or after May 1, 2006. Applicants can be academics, practicing designers (working independently or within a firm), or engaged in allied fields such as public policy, real estate, community development, institutional philanthropy, engineering, law, international development,etc. Applications from both within and beyond North America are encouraged. Those engaged in landscape issues, but operating outside of the traditional discipline of landscape architecture are of particular interest. 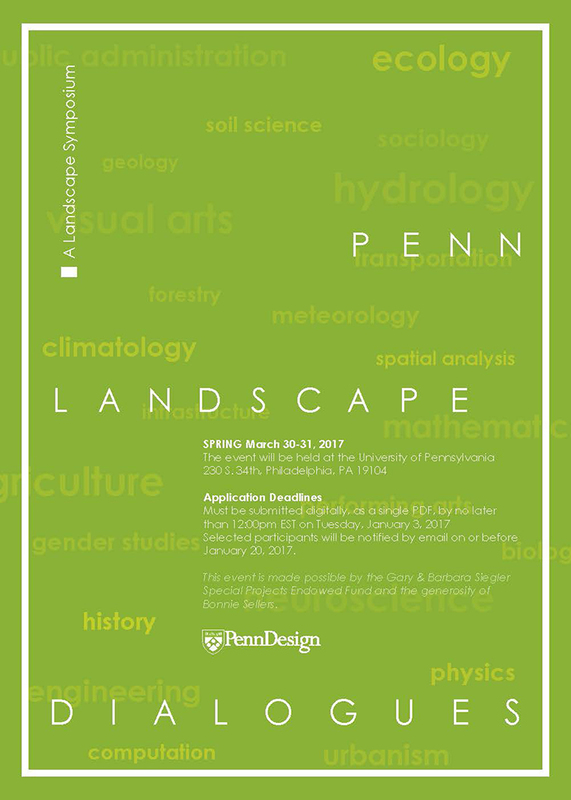 Note: current or former employees of the University of Pennsylvania School of Design are not eligible to participate. – 750-1,000-word statement of intent (max two-page, 8.5×11 or A4) that responds to the question of landscape’s capacity as medium for engaging issues of contemporary culture, ecology, technology, politics and urbanism. This statement should concisely describe the motivations behind the applicant’s work; the activities she/he have undertaken in pursuit of these motivations; where the applicant sees this work going; and why this work is relevant to contemporary/future landscape discourse. – A 20-page (8.5×11 or A4) work sample that clearly supports the content of what is discussed in the statement of intent. This document can include independent scholarship, portfolio of design work, media coverage of projects, etc. File size may not exceed 20MB.